This year, the Nintendo booth at E3 was completely dedicated to Wii U games, specifically games that we might see as launch or near-launch titles when the console becomes available later this year. While many gamers look for a Mario, Zelda, or Metroid title to be their killer app on a Nintendo console, I always look for something new in the world of WarioWare, partially because WarioWare titles have a history of being able to show off new technology in a fun and interesting fashion, and partially because it's impossible to not like games about fighting giant robotic noses with a banana cannon. Game and Wario is the brand new WarioWare title being developed for the Wii U, but it's an entirely different beast from the WarioWare games you have come to expect. 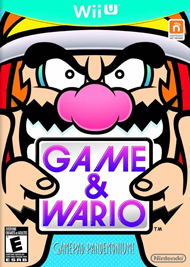 Game and Wario (a fusion of the titles Game and Watch and WarioWare) does away with the classic WarioWare formula of three second mini-games, instead choosing to make its mini-games about three minutes long with multiple parts. 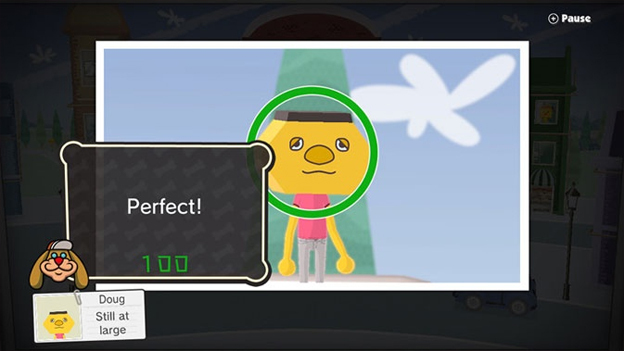 Essentially, every mini-game in Game and Wario is a boss mini-game from a WarioWare title. Four were available to play on the show floor, though we were assured that many more games were going to be available once the title officially releases. The first mini-game I got to play was Shutter. In this mini-game, you are tasked with snapping pictures of five criminals that are wandering around the city. 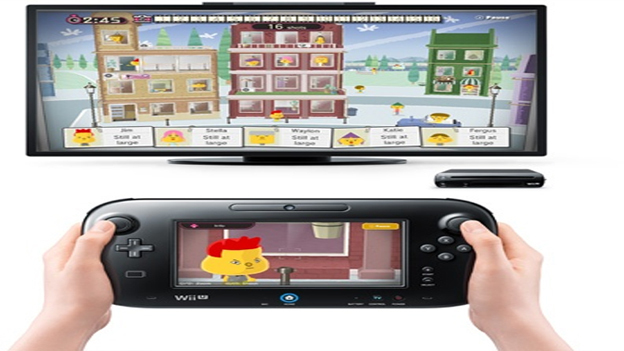 You can see a zoomed out view of the city on the TV screen but you can look through the lens of your camera by looking at the Wii U GamePad. The game operates like Silent Scope, believe it or not. You are constantly trying to find your target's position on screen so you can capture them on the small screen. Once you find your criminals and take their pictures, you are rated on how clear the photo is (the camera focuses if you hold it still), how centered the photo is, how in frame the criminal is, and how close you managed to zoom in. You can also get bonus points for snapping pictures of some iconic WarioWare characters that are hidden Where's Waldo-style. The second mini-game that Nintendo showed me was Ski, a next generation version of Ski Free. No… really, it was almost exactly the same! You control Jimmy on a downhill ski slope, and are tasked with avoiding obstacles and hitting ramps and boosts in an attempt to get to the bottom in an acceptable time. 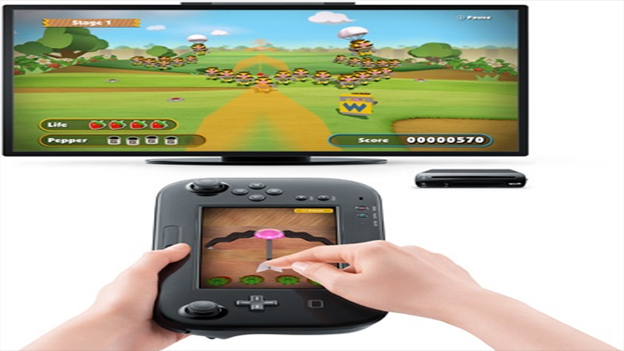 The entire course is shown on the Wii GamePad, and to steer Jimmy, you simply tilt the GamePad left and right. Honestly, the only thing the game was missing was a yeti that tries to eat you, though a booth rep did say "some surprises are in store" when I said that. Multiplayer competitive next-generation Ski Free nostalgia? Yes please! Arrow was probably the most complicated Game and Wario mini-game on the floor. Taking place in the first person perspective, you are an archer that is firing nose arrows at robot Warios that are trying to steal your strawberries. Yep. To ready an arrow, you slide back on the Game Pad's touch screen. Pulling back more fires the arrow further, and you aim by moving the Game Pad itself. If you collect pepper by shooting it on the field, you can tickle the nose to make it red, which makes your next arrow an explosive sneeze arrow that can take out multiple enemies at once. There are also mines you can shoot on the field to cause explosive chain reactions that wipe everyone out. Shooting multiple enemies at a time gets you more points, and the objective of the game is to get the highest score after defeating the giant robot Wario tank at the end.